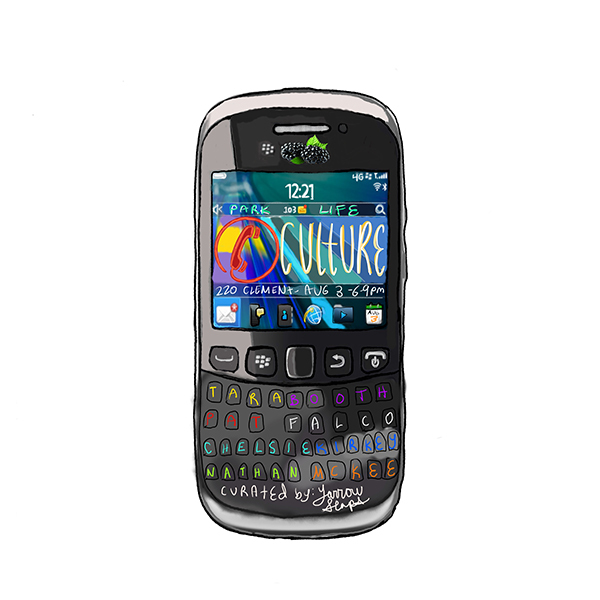 Phone Culture - curated by Yarrow Slaps - Opening at Park Life August 3. A Group Show featuring Chelsie Kirkey, Nathan McKee, Tara Booth and Pat Falco. Curated by Yarrow Slaps. Phone Culture, curated by San Francisco native Yarrow Slaps is the product of his visit to New York last summer. Out of his element, in a big city, Yarrow found himself people watching and listening to passing conversations while walking down the Lower East Side/Bedstuy streets. He began thinking the words phone culture, noticing everyone immersed in their pocket sized technology. Whether someone is walking through an intersection immersed in Instagram, or taking selfies at a park, it’s obvious that phone culture puts us in our own boxes, looking through others profiles, making us self absorbed and forgetting our own social skills. When we’re bored most people will just scroll through their phones instead of getting in what could be an enlightening conversation with someone they don’t know. How would some of his favorite artists depict the current state that we live in, where literally everyone is on their phones? Phone Culture investigates how artists Pat Falco, Nathan Mckee, Tara Booth and Chelsie Kirkey interpret these feelings and concepts, incorporating their unique brands of humor, and emotion. Chelsie Kirkey (b. 1987) is an American artist living and working outside of Chicago. Figurative and made with careful composition, her paintings, often self-portraits, invite the viewer to witness captured and intimate moments of home life, and offer personal reflections of both body and spirit. Employing photography as a reference for many of her paintings, her process to create is thought-out and meticulous. Recurring motifs in her work include floral and woven patterns, fine details, and rich colors that evoke a sense of romanticism and time and place. Chelsie has shown in number of cities nationally and internationally, including Chicago, Seattle, San Francisco, Los Angeles, New York, and Oslo. Nathan McKee is an artist and illustrator who lives and works in Portland, Oregon. McKee’s illustrations and paper cutouts utilize simple lines and flat color, and are inspired by comics, sports, music and other elements of popular culture. His works have been included in exhibitions around the world like Los Angeles, New York,Chicago & Japan and clients have included but not limited to Bleacher Report, Adidas, Puma, and the Ace Hotel. McKee studied at the Pacific Northwest College of Art.